Special thanks goes to tbremise,shadross, lumberjay, Kaelikbug, Glameowsgame, liamandjonah, 10otavio20, lamper, and epicpacman567, all of whom whose Graphics were used in the game. Princess Zelda has been kidnapped by a dark prince dubbed Malpuro. He has taken the only thing that can destroy him, the primal sword. He has blasted you, sir Link, all the way over to teal road. Luckily you are near the location of his first minion that guards the power of the sword. 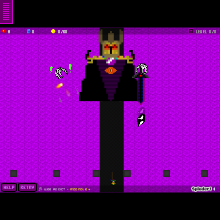 Can you reach the dark lord in his tower and save Zelda before his troops take over the world?